Venturi Health Care Group recognise the importance of celebrating excellence within care, we want to ensure the extraordinary lengths our staff team go to within each of our homes is acknowledged and rewarded. 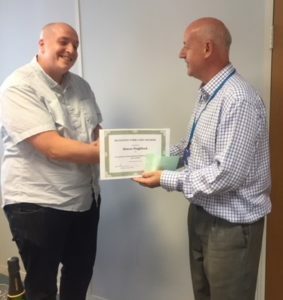 As such, the company has recently rolled out a new initiative, the “Annual Care Awards” which recognises individuals who go to extraordinary lengths to deliver our Care Values, ensuring Residents receive responsive, nurturing care from committed genuine individuals. The Care Awards are inclusive and celebrate the hard work of employees across all departments within our service. Residents, staff and visitors of Rivington Park Care Home have been nominating those who they believe should be awarded the 2018 Care Award and the winner was Simon – Chef. Rivington Park Care Home celebrated Dignity Action Day on the 1st February 2018 with a tea party, there were plenty of delicious treats available for everyone to tuck in to! This event gave both residents and relatives the opportunity to discuss what they believed dignity in care to be, how they felt as though this was achieved and how it made them feel. As way of cementing these thoughts and feelings, everyone was asked to write down their thoughts on a leaf, which now sits proudly on the homes Dignity Tree. It is hoped that this will be a constant reminder to all staff, residents and visitors that dignity within care is essential at all times. The staff within Rivington Park are extremely passionate about the dignity in care campaign and they strive deliver this at all times, this is achieved through tenderness and generosity. If you visit Rivington Park please feel free to add your thoughts to our Dignity Tree.